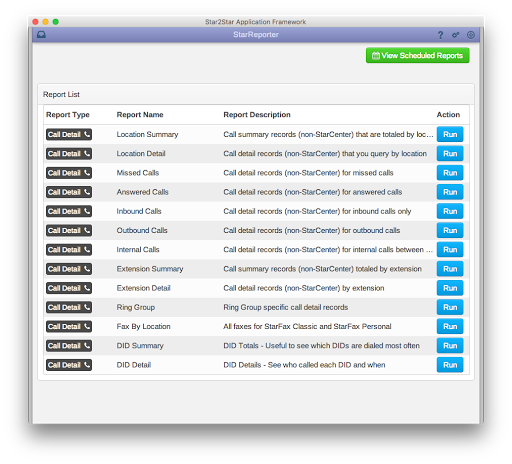 StarReporter is a package of 13 enhanced call detail record reports for Star2Star Cloud Connection Manager 2.0. These reports provide valuable, digestible business analytics to Star2Star customers. StarReporter is our stand-alone call reporting application that contains non-StarCenter Call Detail Record data drawn from the StarBox® Voice Optimized SD-WAN and Constellation Network. To access StarReporter, just log into the Star2Star Application Framework, select the StarReporter starlet from the menu, and begin viewing. StarReporter requires Star2Star Cloud Connection Manager 2.0.